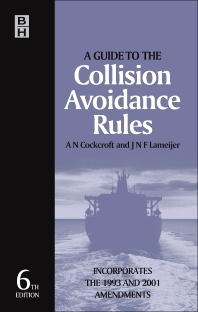 A Guide to the Collision Avoidance Rules is the essential reference to the safe operation of all vessels at sea. Published continuously since 1965, this respected and expert guide is the classic text for all who need to, practically and legally, understand and comply with the Rules. This sixth edition incorporates all of the amendments to the International Regulations for Preventing Collisions at Sea which came into force in November 2003. The books sets out all of the Rules with clear explanation of their meaning, and gives detailed examples of how the rules have been used in practice by seafarers, as well as excerpts from Court judgements to illustrate how they have been interpreted in practice. Written for masters, navigating officers, senior crew, cadets and those in training, plus ship operators, marine lawyers and anyone concerned with the safe operation of shipping, this is an essential reference for at sea and on shore. Professional: Marine/shipping company managers/transportation managers. Ships masters, Navigating officers and senior crew. Practicing and consulting maritime engineers. Maritime lawyers, insurance analysts and loss adjusters. Coastal and port authority personnel. Ship owners and operators (inc. private individuals who sail larger vessels). Used by the Royal Navy and Royal Navy Reserve on Navigation courses. Academic: Nautical college students and those studying for professional marine qualifications, in particular anyone preparing for a watch keeping certificate of competency exam. Students of shipping management, marine and ocean engineering and maritime administration. Foreword; Preface; Collisions and the courts; History of the collision regulations; Part A, General Rules; Part B, Steering and sailing rules; Part C, Lights and shapes; Part D, Sound and lights signals; Selected examples of ships' lights; Part E, Exemptions; Annexes to the Rules; International convention regulation on standards of training, navigational certification and watchkeeping; IMO recommendations; Table for use in assessing risk of collision; Manoeuvring to avoid collision; Ships referred to in the text; Index. Marine consultant and collision regulations expert, UK. Former International Maritime Organization (IMO) collision regulations committee member. Marine consultant and collision regulations expert. Former International Maritime Organization (IMO) collision regulations committee member. Jan Lameijer has been actively engaged in matters related to COLREGS and Ships' Routeing as an advisor to the Netherlands Administration from 1969 until 2010. As a representative of the Netherlands Administration Jan has been active for about 35 years in working groups of the Sub-Committee of Safety of Navigation, concerning COLREGS and Ships' Routeing. For more than 10 years Jan acted as chairman of NAV-subcommittee working group on ships routeing. In recognition contributions to navigation, The Council of the Royal Institute of Navigation awarded Jan the Institutes Gold Medal for the year 2004. Marine consultant and collision regulations expert, Norway.